The Department of Justice – and common sense – tells us that violence against women is predominantly committed by men. With women’s personal safety always at the forefront, learning to use “male-encoded” language can be very helpful in certain circumstances. Broadly speaking, aggressive males only understand communications – verbal and non-verbal – that read as male. This is not to diminish the power and effectiveness of communication styles that are traditionally female-coded. It’s about what works in a confrontation between an aggressive man and an intimidated woman. 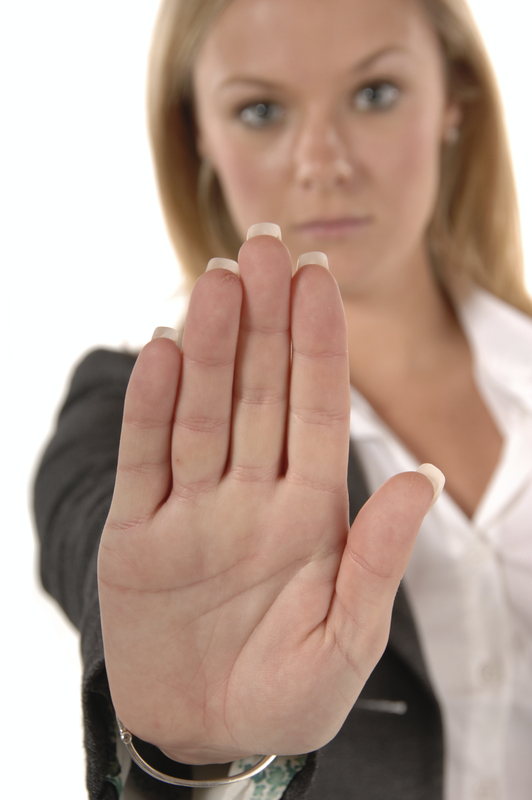 Of course, the best way to avoid a confrontation is to … avoid it. Leave the scene when you can. But real life doesn’t always work that way, and you need to have some strategies in mind so you’ll know what to do if confronted by an angry, aggressive, or otherwise inappropriate person. When a woman is dealing with a confrontational male, the social contract tells us to be quiet, not make a scene, and hope the encounter ends quickly. We are told, implicitly and explicitly, that speaking up for ourselves makes things worse. The truth is, being quiet and submissive was always a deeply flawed solution, and when faced with a nonresistant woman, many men will feel empowered to escalate the violence. And politely asking an aggressor to stop being aggressive simply doesn’t work. Although it goes against our collective cultural conditioning, oftentimes the best response to a confrontational or inappropriate male is to be loud and firm, in a tone that allows no room for negotiation or argument. Consider the difference between a woman quietly saying, “Please stop doing that. You’re making me feel uncomfortable,” versus the same woman saying, “YOU! CUT THAT OUT!” while making a noticeable jerking motion with her thumb. The assertive approach accomplishes two things: it puts the aggressor on notice that you are NOT an easy target and whatever he does to you will come with a consequence; and it alerts anyone nearby that you are in a precarious situation and they may need to step in or call for help. Before you’re ever faced with a situation, think of aggressive phrases men use, and role-play saying these same things out loud. Practice until you’re comfortable saying these things firmly, authoritatively, and are able to call them up instantly. “YOU! CUT IT OUT!” “GET OUTTA HERE!” “BACK OFF!” “HEY YOU! SHUT IT!” and “YOU BACK UP!” are some examples. Drop your voice to a deeper register and deliver loud, firm COMMANDS, NOT REQUESTS, like a drill sergeant – as if you EXPECT to be obeyed, and anything else is unthinkable. Use male-encoded body language when you issue these commands. Stand at attention – straight, with your feet shoulder-width apart, shoulders back, head up, with a serious face. Look fearless and resolved. At the same time, maintain your personal space as much as possible, as staying out of reach is always important. Don’t worry about being rude or making a scene. Go on and MAKE A SCENE. Your personal safety always supersedes other people’s feelings. Using assertive, male-encoded language should always be one of your strategies in maintaining your personal security. This entry was posted on January 22, 2017, 11:36 am and is filed under Human Resources, Outside Sales. You can follow any responses to this entry through RSS 2.0. You can leave a response, or trackback from your own site.